API stands for Application Programming Interface. If the diagram above doesn’t make sense to you, think of an ATM. The ATM screen and keyboard are the Application. The internal machinery is the API. Your bank is the server/database. Your card is your authentication. Only available for certain packages. Once bought, will be available to you only after 3 working days. Contact us if that does not happen. Currently, APIs are only available for use on live marketplaces by users who are subscribed to the Growth and Scale Packages. Note: ClientID and Client Secret will be available to you 3 business days after you buy the Scale/Growth. If not, contact our Arcadier support. Using our APIs, you could display a merchant’s items on your own personal website or blog, along with an “Add to cart” and “Checkout” button. This allows people to buy on your marketplace without having to actually visit your marketplace. With more advanced use of our APIs, you can build your own website to look the way you want, with features you want. Search the related artists of the artist of the track obtained from 1. Search top tracks of each artist obtained from 2. The result is a web app that curates a whole playlist using one song, by choosing the top tracks of artists related to the artist of the song you choose – All in one click. 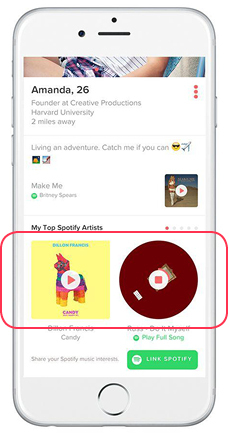 Another example is how Tinder’s app uses Spotify’s API to allow tracks to be played with one click on an individual’s profile page. Get up and running within 24 hours. Our APIs have been built and tested by our dedicated team of developers who have a combined 120 years of experience and has been working on this product over the last 4 years. We are also constantly maintaining and adding improvements; so, as you grow and need more features, it is likely we will already have a solution waiting for you! We have an assurance of 99.9% uptime and strive to ensure it. For API bugs and support, we have a forum where issues and resolutions are socialized and a helpdesk system for general faults. The only limitation is your imagination. Build anything you want for your marketplace and make it represent the image and personality you want to convey to the world. Every API can be tested on our sandbox marketplaces and using Swagger (link to swagger at bottom), the endpoints can also be tested and evaluated. Combined with our full API documentation, tutorial and guides you are free to create anything.